Coverage: Live on BBC One, BBC iPlayer, BBC Radio 5 live sports extra, BBC Radio Scotland 92-95FM & the BBC Sport website and app. 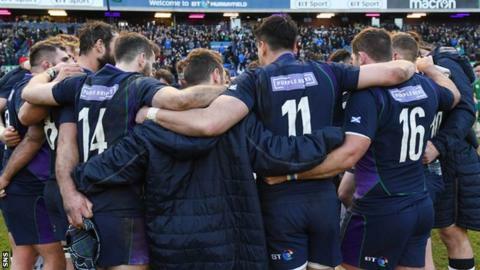 Twenty days ago Scotland kicked off their Six Nations campaign with some hope and not a little expectation. Italy at home followed by Ireland at home followed by a trip to France to play a beleaguered team that has forgotten how to win. Grounds for optimism, for sure. At the time, some were whispering about a championship bid. Rugby is a brutal game and it's only getting more brutal and more cruel for those who play and those who watch and dream about a great Scottish revival. Since that opening day, key players have been dropping like flies. Stuart Hogg, Huw Jones, Finn Russell. WP Nel, Sam Skinner and Ryan Wilson all started against Italy and all are now injured. Six important men - gone. That's on top of the other starters who never made it as far as that first match. Duncan Taylor, Matt Scott, Mark Bennett in the midfield. John Barclay, Hamish Watson, Blade Thomson in the back-row. It's fair to say that Scotland will be without seven probable starters in Paris. You can look at that two ways - a Six Nations-wrecking nightmare or an opportunity to develop depth and give game-time to others ahead of the World Cup. In reality, it's a bit of both. Gregor Townsend will not be writing off this Six Nations but such is his freakish causality list he'd be forgiven if he was thinking more long-term than short-term right now. The ultimate tournament this year is not in the spring, it's in the autumn. If he had to pick a time to have all his main men fit and firing it wouldn't be now, it would be in September and October at the World Cup in Japan. In the double-life that Scotland are now living, all the top boys will be back and there will be options all over the shop heading into the first fixture against Ireland in Japan. A fully-loaded Scottish squad would frighten the Irish, no question. It would frighten most nations. It's a tantalising thought. We'll have to wait a while to know if it comes to pass, but in the meantime there is the here and now and this visit to the Stade de France, a place that will either rejoice, finally, in a sign of life in its team or bury it six feet under amid a cacophony of derision. Quiz: Are you the ultimate Six Nations fan? The worst French team ever? It's worth recapping where France are at the moment. They're on their worst run since the early 1900s. Some local experts say this current sorry lot, with three wins in 19 Tests, is their worst in history. During that dismal list of defeats they have been ahead many times and have blown the victory through their own lack of fitness or their own lack of bottle - or a mixture of both. They were 16-0 ahead against Wales and lost. They were ahead at half-time against Fiji and lost. They were 14 points clear of South Africa early in the second half and lost. They were leading Ireland with seconds left on the clock and lost. All of these were home games. "In the course of the match there is always this fear of winning that resurfaces, these old demons who come back," said Baptiste Serin, the scrum-half who will be on the bench on Saturday. In Jacques Brunel they have another coach who has inherited problems and then added to them. The Midi Olympique newspaper wrote about "winds of rebellion" after France got horsed 44-8 by England a fortnight ago. Two of the players who aimed thinly-veiled criticism at Brunel - the half-back pairing of Camille Lopez and Morgan Parra - have been dropped from the 23 this week. "There is nothing to say," remarked Brunel after the humiliation at Twickenham. Actually, not true. There's been plenty to say and no shortage of people to say it. "It was chaos (against England)," said one French player, who wanted to remain anonymous. "Nobody knew what positions to play. We were lost on the pitch..."
In their opening fixture against Wales, amid a substitution reshuffle, Sebastien Vahaamahina didn't know that he was captain until referee Wayne Barnes informed him. Thereare loads of examples of this mayhem. Players being selected, then dumped, then selected again. Centres told to play on the wing; a wing told to play at full-back. Young players being messed about where other coaches would handle them more carefully. A shambles. On Saturday, Brunel, whose natural demeanour is that of an undertaker, has shuffled again. He's on his third full-back in three games in Thomas Ramos. On the right he is persisting with Damian Penaud despite Penaud being a centre - and a fine one at that. At 12 he has gone from Romain Ntamack (against Wales) to Geoffrey Doumayrou (against England) to Gael Fickou (against Scotland). He has a brand new half-back pairing in Ntamack at 10 (he has played little rugby at 10 for Toulouse) and Antoine Dupont at nine, a class act who he has been reluctant to start. In the horror show against England, Dupont came off the bench, made 11 breaks, ran for 78m and beat nine defenders. In 33 minutes he did infinitely more than others who were out there for 70 and 80 minutes. At least Brunel has picked Fickou, a centre, at centre, and Yoann Huget, a wing, on the wing, and Ramos, a full-back, at full-back. French rugby almost swooned at the selection. Players in their normal positions? Sacre bleu! Will French 'desperation' trump Scottish 'hope'? France are under an unimaginable amount of pressure. Scotland, realistically, are under no pressure at all. That's a potentially interesting dynamic. France's desperation for victory might be enough to get them a win, but the longer the Test goes with that victory in jeopardy the more likelihood there is of another implosion. Remember Serin's words. The fear of winning. The old demons. Scotland's job is to make sure they stay in the game long enough for the demons to turn up. The French are not a second-half team. Their tanks start to empty, their confidence drains. Scotland will be fitter and better conditioned to go the distance, no question. Everything is predicated on them getting a decent start and not gifting France easy respite through their own errors like they did repeatedly against Ireland in the last 40 minutes. Even without so many front-liners, this is a decent Scotland team. You'd rather have Pete Horne in the midfield than at 10 but it's not Johnny Sexton or Owen Farrell he's going up against on Saturday, it's a talented but callow Ntamack. It's a sign of Scotland's excellent depth in the back-row that they can still pick a hardy trio in Magnus Bradbury, Jamie Ritchie and Josh Strauss despite missing Barclay, Watson, Wilson, Skinner and Thomson. With more experienced players available, Scotland would travel almost in expectation of putting France to the sword and ending a run of 20 years without a victory in Paris. There might not be expectation this time, but there is hope. And a sense of perspective. Can you name the last Scotland team to win in Paris? Share your score with your friends!